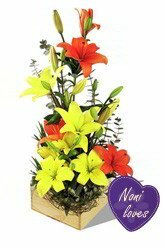 This stunning boxed arrangement of Asiatic Lilies is something spectacular. The amazing combination of orange and yellow is breathtaking in the true sense of the word!Lilies may be sent closed/partially closed in order to prevent damage and to last longer.We recommend you add a Superior Box of Chocolates to make the overall impression a little more fancy and is sure to bring an even larger smile to the lips of your special someoneNoni says: "I send this for all occasions… Personally speaking I love lilies, especially Orientals, but not everyone likes their strong scent. For me, Asiatics become the obvious choice. The Breathtaking arrangement enables me to get my message across, not just with simple words on a card message, but with the bright happiness reflected in the flowers themselves."